The Concierge Earpiece was designed with the Hospitality Industry in mind. Whether in a noisy casino, restaurant or front desk and valet, this super versatile earpiece will answer all of your issues. The Coiled Tube, especially when coupled with the semi-custom Skeleton Earmold is by far the most comfortable way to wear an earpiece, even for twelve hour shifts - you won't know it is there. 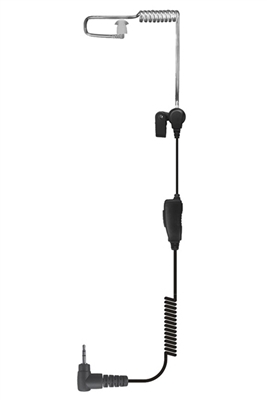 The straight through wire design helps to orient the directional microphone properly to ensure good communication in noisy environments and also lays flat so it doesn't disturb clothing lines. As with all Custom Earpiece products, the Concierge comes with a one year, "If you can break it, we'll replace it warranty", against all failures! The CE Concierge earpiece was designed for Vocera, Theatro, and Ascom devices. We designed this with the Hospitality Industry in Mind. The straight through design of the cord helps orient the microphone correctly and requires less unsightly wires. The microphone is somewhat directional making this the perfect earpiece for "noisy" (such as a casino) areas. The clear coiled tube, especially when paired with the Semi Custom Skeleton style earmold is exceptionally comfortable, you can wear it twelve hours a day and not even know it is there! As with all Custom Earpiece products the Concierge features Kevlar reinforced wires and stapled strain reliefs for exceptional durability and includes our exclusive one year, no questions, "If you can break it, we'll replace it" Warranty. Top of the line equipment and a company showing us a rare level of Customer Service the likes of which deserves Honorable Mention. And we can't leave out their LIGHTENING FAST shipping. Amazing. Earpiece works great with Vocera. Cord is a little long to wear vocera on lanyard or clipped to collar, making it difficult to quickly take off to enter into MRI but overall a great earpiece. very well built appears to be, of solid construction. My only complaint is the volume is not very high even with the vocera volumes turned all the wat up. It would be nice to have sometype of inline volume control.